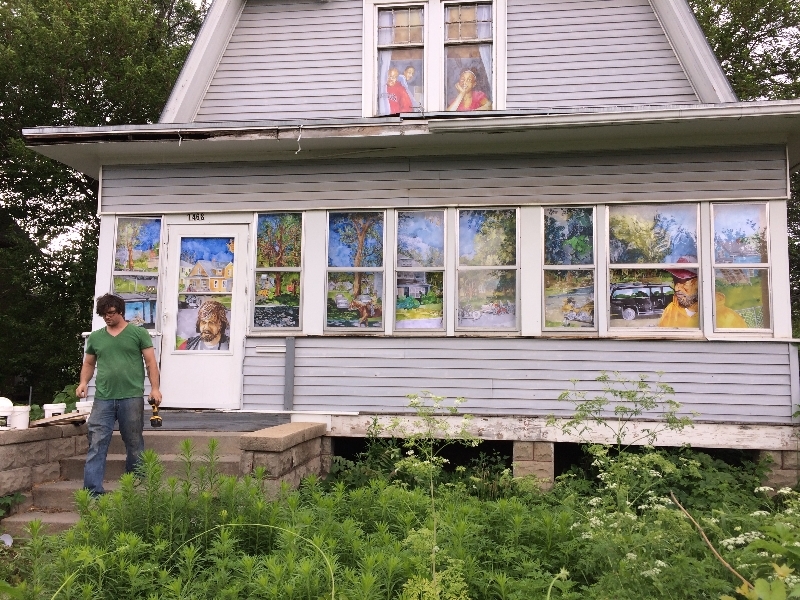 Art assumes the roles of anthropology, archaeology, and novelization in Omaha artist Watie White’s new public installation that features 30 magic realism narrative paintings adorning the windows of an abandoned North Omaha house. Each image is based on artifacts left behind by the family that lived there to tell the stories of the home and its former residents. The site of the project is a house at 2424 Emmett Street, smack dab in one of the poorest neighborhoods in the city. As soon as the installation is taken down plans call the house to be razed and a new one built in its place. On its face Watie White’s new public art project at an abandoned North Omaha house could be construed as a privileged white guy coming into the black community to impose his perceptions on that place and its people. But that’s not the case with his All That Ever Was Always Is outdoor installation at 2424 Emmet Street. Enlarged digital prints of 30 narrative paintings he’s made cover the home’s windows. The house serves as a two-story, three-dimensional, wrap-around canvas for his true fiction portraits of the home’s former occupants. 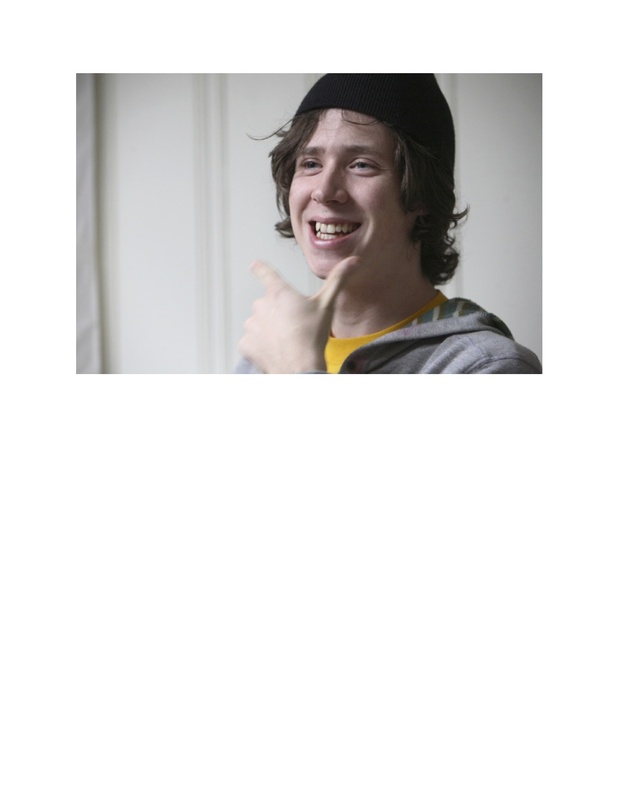 He invites viewers to bring their own interpretations to bear. 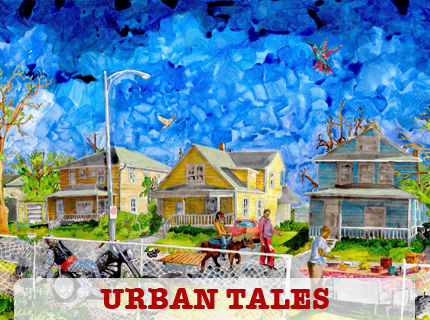 White’s paintings draw on interviews he did with neighbors, public record searches he and assistant Peter Cales made and a trove of personal artifacts harvested from the home, whose last residents were a black family named Smith. He and Cales also fashioned planters and benches from found objects there. The artists discovered a vast assemblage of strewn items inside that represent a tableaux of lives interrupted. In that suspended animation space White became the anthropologist his parents were. He says the ephemera made the house an “active participant” to inform the narrative. Birth certificates, family photos, letters, journal entries and divorce papers helped him piece together four generations of history. He discovered the grandfather, Nathaniel Ware, was a Pullman Porter who moved the family up north from Mississippi. His daughter Janet Ware married Leonard Smith, an Omaha policeman. Janet was active at Salem Baptist Church. A daughter, Candice, followed her heart to Memphis. A son, Michael, may have been the last family member to reside at the Emmet address. “He appears to have just left and walked away from everything before selling the house to Habitat,” White says of Smith. What the materials didn’t reveal to White he extrapolated with the help of live models acting out back stories in his studio. White purposely didn’t contact the Smith family to avoid being overly influenced. He has many questions for them, however. He’s inviting them to the opening, when he plans presenting them a chest made from recycled materials in the home that will contain the personal artifacts he salvaged. 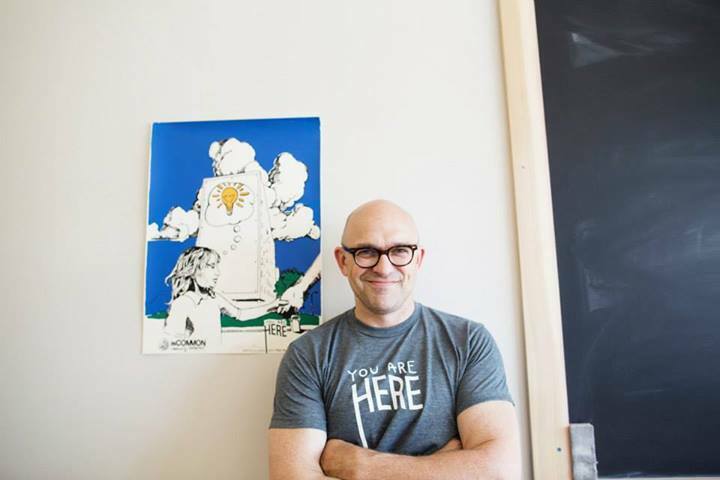 “When you stop treating it as a place you have to shun or fear or stay away from then it’s a little less fearful and a little more welcoming,” White says. Engaging at-risk populations with public art is something White learned under Chicago conceptual artist and radical educator Jim Duignan, whose Stockyard Institute White has a long association with. In preserving everyday people’s stories White does in images what the late iconic Chicago writer Studs Terkel White did in words/ White. who moved to Omaha in 2006, often shows his work in Chicago. For more about the artist visit watiewhite.com.